Climb in, on, or across the Happy Caterpillar! Kids’ ages 2-4 will love to play in this colorful climber for hours of educational fun. The brightly colored body segments can also be assembled in different ways with large “feet” holding the unit in place for secure play. The Happy Caterpillar can be utilized for indoor or outside fun. Happy Caterpillar – great for preschool age fun! Kids can climb in, on, or across the Happy Caterpillar. Children will enjoy counting the Happy Caterpillars brightly colored feet and discover plenty of full of life colors. Preschoolers will likely be enticed to climb up onto the Happy Caterpillar and hug its head and neck, or crawl in the course of the sunlit tunnel. They are able to perch on top to sing songs with friends or listen to a story; what a neat place to assemble! The Happy Caterpillar is great for active preschoolers to stretch their legs and imaginations! The More than one colors, tunnels and circles encourage young children to play indoors or outdoors. Friends can play safely immediately at the Happy Caterpillar’s colorful body segments. 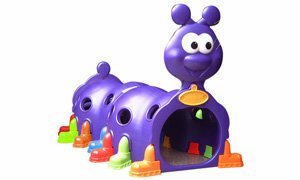 The Happy Caterpillar is big enough for preschoolers to enjoy and the easiest size to suit into limited space. Crawl for your belly in the course of the belly of this smiling purple playmate. Durable and fade resistant, the Caterpillar is soundly constructed to resist a variety of love from playground pals. Interchangeable caterpillar feet let children come to a decision exactly what they would like their caterpillar to appear to be! After putting at the legs, the Happy Caterpillar is in a position for active children to enjoy. Great for child care centers, playrooms, classrooms, indoors or outdoors for all-around fun! Ready to gather Happy Caterpillar comes with the entire important tools and instruction for simple and quick assembly.